Last Sunday was gorgeous, and consequently, my sister, father and I decided to go kayaking on the Delaware-Raritan Canal. Consequently, it was inevitable that I would bring a rod and do some fishing. It was a beautiful day, but the fishing was less than phenomenal. 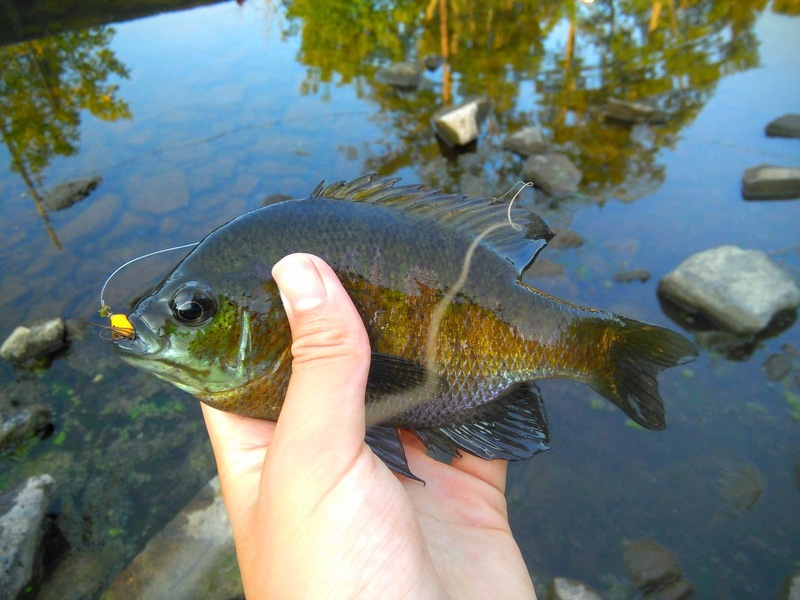 After about an hour and a half of messing around with lures, all I had to show for my efforts were a couple small bluegill. The water had only just begun to warm, and the fish I encountered in the canal were rather lethargic. After throwing some lures for a while and returning the kayak, I decided to fish the nearby Millstone river while I was waiting for my ride. I only had 15 minutes, and I didn't expect much. After all, this was the Millstone. I had never caught much from this seemingly lifeless river except for one outing when I miraculously scored a lifer channel catfish and american eel. This side of the Millstone, however, was a complete different story. The water was clear and tannin-stained, and I saw what I presumed to be large shiners swimming near shore. 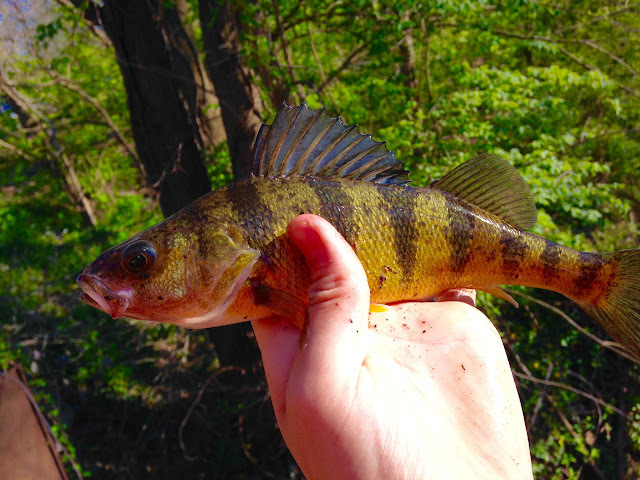 I tossed my jerkbait out, and on the first cast, I saw two decent perch follow it in. Exited, I rummaged around the tiny pack of lures I brought and I found a minnow tube jig. 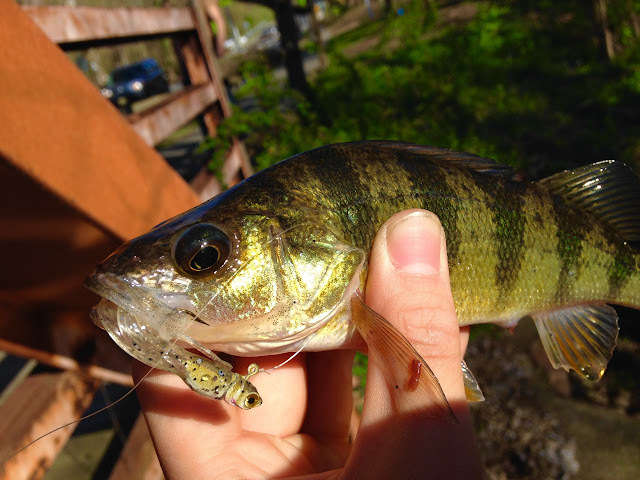 I vertically jigged it for a while, and the perch would tentatively mouth the bait, followed by immediately spitting it out. It was time to switch tactics. I cast a bit farther and aggressively ripped it back. Suddenly, I glimpsed a flash of green and gold, and set the hook. 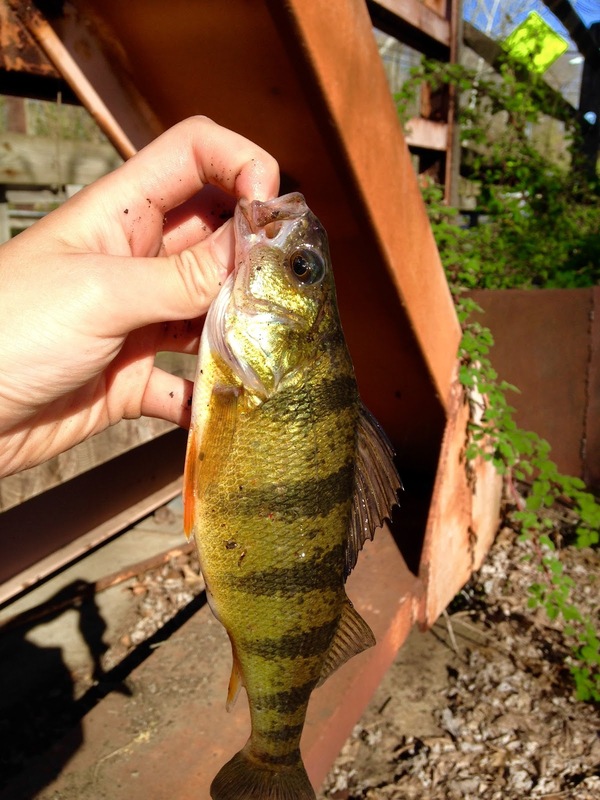 After a brief fight, I had a new Personal Best yellow perch! 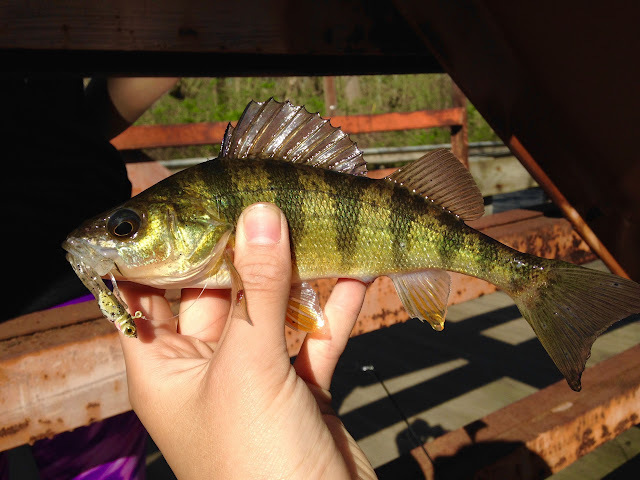 Remember my previous perch were all of 4 inches, and this was a decent perch, no monster but nice sized, especially for a river in Central Jersey. 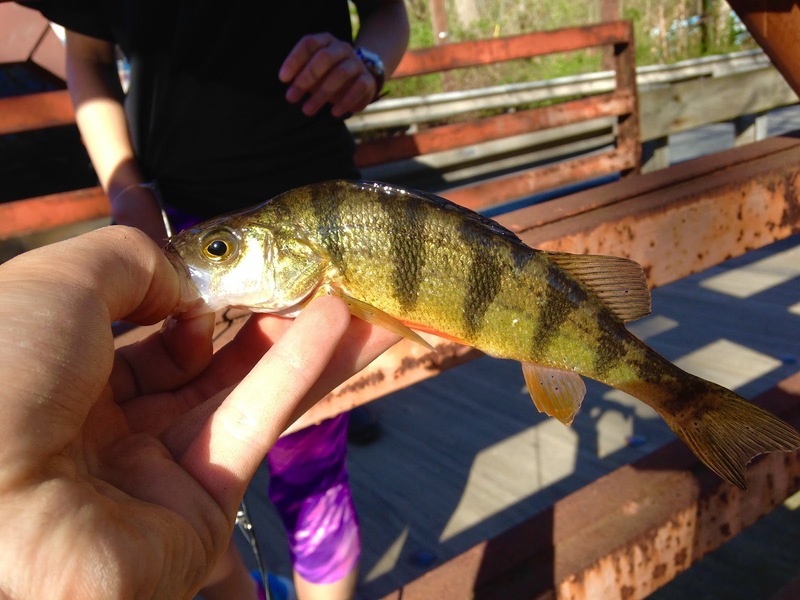 It also happens that this was my first yellow perch caught in NJ. What was really interesting was the group of 3-4 decent sized yellow perch following my fish as it fought. So immediately after my first fish, I sent the jig down again. Not two casts later, I hooked up again on a much nicer fish, and quickly broke my PB again! I also hooked some decent bluegill and one more small perch. before I called it a day. Last weekend happened to be a long weekend, so my family made some last-minute plans to go to Alexandria, VA for a day trip. Easter weekend in DC was packed to the point of immobility, so we opted for the nearby town still steeped in American history. Of course I wanted to get some fishing involved, as a result, I looked up some spots, packed up my gear, and we were off. The first day, we arrived in Alexandria in the morning, and decided to walk around the old town. It was sunny and beautiful, and we saw lots of interesting things. No bait stores were in the immediate vicinity, and I didn't have time to fish for bait, so I opted to go to Wholefoods, where I bought a whole croaker for bait. After lunch, I went to Jones Point Park to soak some bait in hopes of my first Blue Catfish. 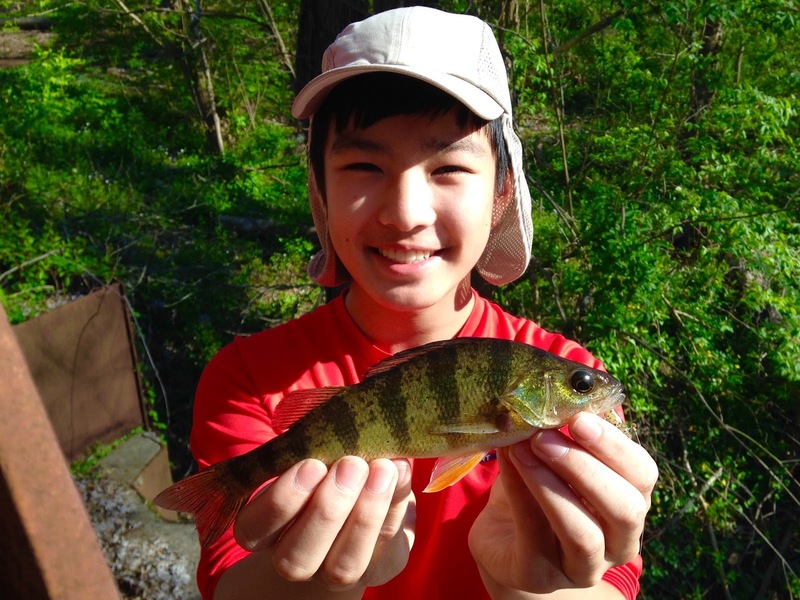 It was my goal to catch one new species of fish on this trip, which, given my relatively short time to fish and my lack of knowledge and planning, was something I was not sure I could accomplish. It turns out, the spot was a bust. The river looked massive and intimidating there, and I had a relatively small casting area. There were many other anglers, but I didn't see any one catch a single fish, albeit for one who caught a bluegill. I soaked cut bait for several hours without so much as a nibble. Disappointed, I called it a day and headed back to the hotel. I did some more research and found a promising spot on Dogue Creek. It was much smaller than the vast Potomac, much, much smaller. 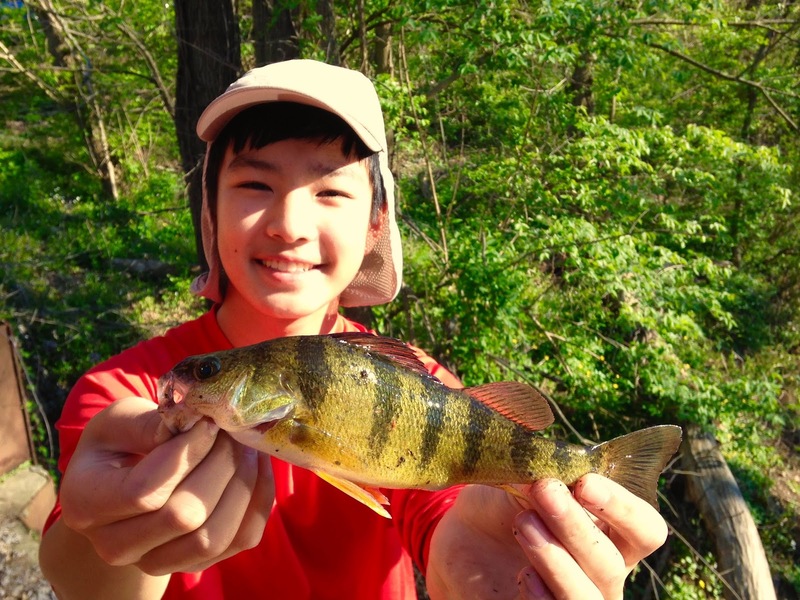 I opted to fish near the mouth of the creek, where it flowed into the Potomac, because the creek was very small in its more upstream reaches. The spot looked good, I had watched videos online of people catching plenty of blue catfish from the exact location I planned to fish. The next morning I headed out at sunrise. It was Easter Sunday, and while most people were getting dressed, preparing to go to church, or getting ready for an Easter egg hunt, I was going fishing for blue catfish! I knew the odds were more in my favor because I was fishing an incoming tide and before a front moved in. However, I was still not confident in my chances. Hopes were not high when we pulled up to a restricted access point. I had not realized that my destination was inside the Fort Belvoir US Army Reservation, and the gate we had planned to pass through was completely barred. I knew there were multiple gates to the fort, so I suggested to my mom that we go through another gate. When we arrived at the next gate, the security guard told us to go to the last gate to do a background check and vehicle inspection. What I was surprised about was that the guards were completely fine when I told them I was here to go fishing. I thought there was no way in hell that I was going to get through. With all this effort, I could only hope that the spot held fish, and more importantly, my target species. 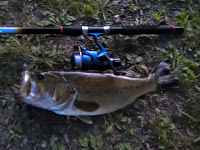 My fishing time was limited to about 2 and a half hours now, because we planned to go to Mt. Vernon later in the morning, and I didn't want to interfere with the family vacation schedule. After driving throughout the fort, we arrived at the location and I walked to the creek (at this part more like a river), while my mom went back to the hotel to get some sleep. There was a general fishy ambiance, but my expectations were still low. Luckily the temperature was comfortable, so out the rods went with a chunk of croaker on 3/0 circle hook on a fish finder rig. I didn't expect to catch anything too large, so my rods and gear were relatively light for what most anglers use for blue catfish. Now it was just a matter of waiting for a bite. About 45 minutes in, the bell on my larger rod goes off and I see the rod arcing over. Racing over, I grabbed it and slowly tightened the line, making sure the circle hook was set properly. The fight was short, but every second felt like years to me. Was this the blue catfish I was waiting for? I strained to catch a glimpse of the fish in the murky water, repeating in my head, please don't be a channel, please don't be a channel... The fish thrashed on the surface and I saw a silver flank, and my heart quickened. I pulled the fish on shore, and I knew I had my blue catfish. It may have been small, but it was a blue catfish! My guess for this fish would be 3-5 lbs. After that fish, the action died down for a bit. As the water got warmer, however, I began to notice shad or herring jumping out of the water. I tied a small spoon on to try to entice these fish, but my spoon was vastly ignored. I'm led to believe that these were gizzard shad, probably what the catfish were feeding on. About an hour later I hear a very tentative jingle of the bell on my larger rod. Then the rod quickly doubled over. Picking it up quickly, I leaned into what was clearly a larger fish. I played it slowly, not wanting any trouble to occur, and it took off on several runs. But the hardest part was when it came time to land the fish. Not having a net, I had to grab the fish by its mouth. This blue catfish was terribly uncooperative, doing "death rolls" and kicking all over the place when I tried to grab it. But soon, it relented and I had a bigger blue cat in my hands. After considerable calculations, I have determined this fish to be ~12 lbs. The fish's stomach was massive, you can really see it in the photo on the right, probably from gorging on the shad stacked in the creek. After the bigger fish kicked away, I set back up and awaited more bites. And they came, but no hook ups, most likely they were small eels or catfish pecking at the bait. After a while, my family came and I headed off to Mount Vernon. I would like to say that this trip was a success in terms of fishing, despite a lack of time and planning, I was able to catch a blue catfish. No monsters were caught, but there's always next time. 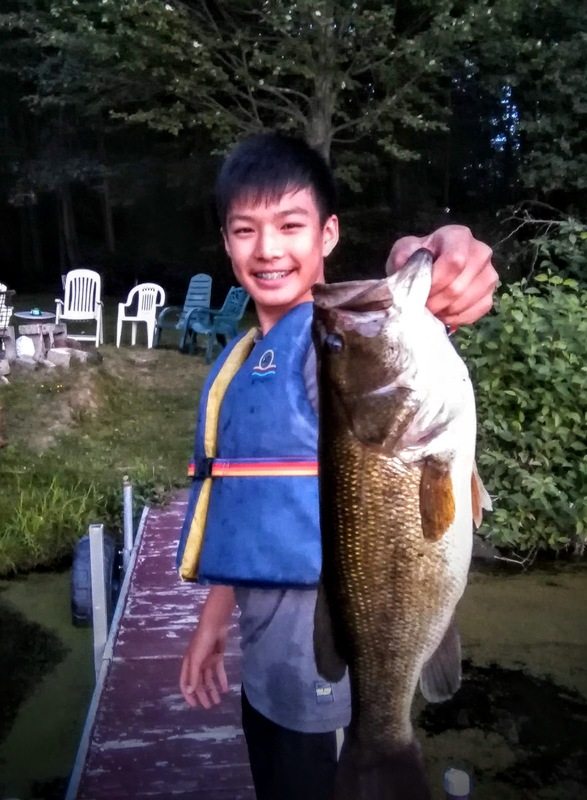 The last day of the Finger Lakes one was a fun one. The atmosphere was relaxed as we packed and reflected on the trip. In the afternoon, I found a little creek under a dam of a pond near Lamoka. The pool under the dam was low and choked with fish. And by choked, I mean literally filled to the brim. As a walked on the edge, dozens of sunfish scattered. 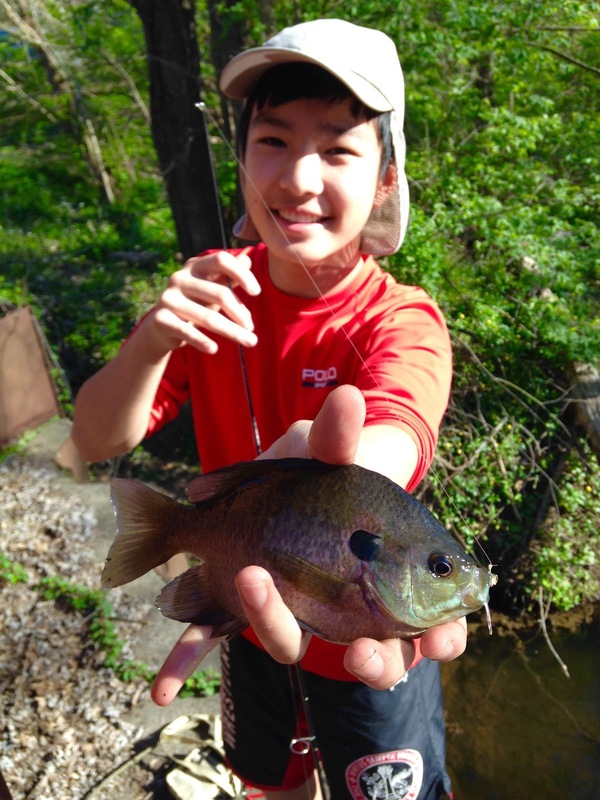 To give you a visual, there was a kid (probably about 8) catching bluegills by hand there. It was a tiny pool, but the fish couldn't travel downstream because the riffle was way too shallow. Sunfish, perch, bass, a pickerel or two, suckers, and some huge golden shiners all resided there. 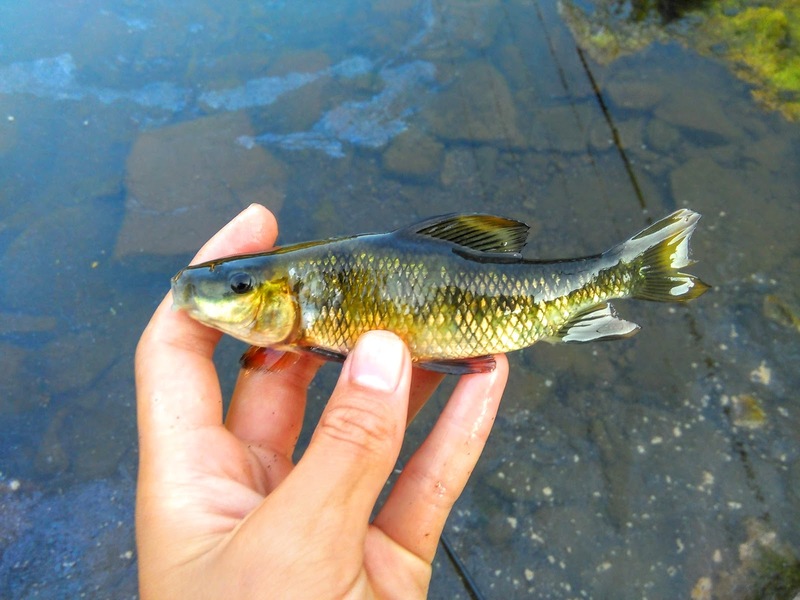 I was looking for some micros, but it was soon clear that the creek was very sterile and the fish present were all washed down from the pond. Having (presumably) caught all the species present there, I decided to try for the bass and pickerel. Immediately I hooked into tons of sunnies and little bass. 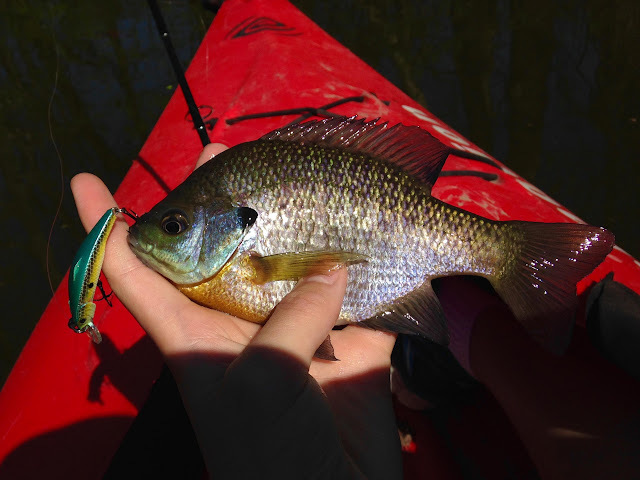 This bronze and green bluegill was interesting. 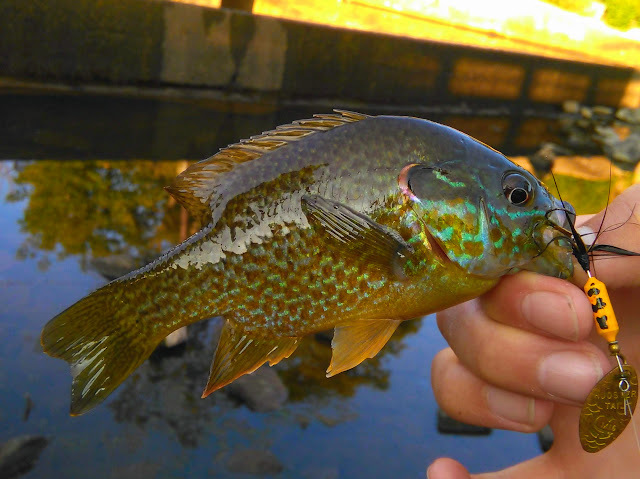 One of the perks of this day was that I hooked into a new hybrid sunfish, a green x pumpkinseed. It's a beautiful little sunny.. Realizing that some of the suckers in the pool were creek chubsuckers instead of whites, I immediately tried for this rarely caught fish. But the sunnies proved to aggressive and fishing for the chubsuckers was too difficult. Unlike Moby Dace, this one was impossible. Returning to Lamoka and the cottage, I decided to do some fishing out of the kayak after dinner. I set off, and later my grandpa joined me in the other kayak. I spent about 2 hours fishing, and caught one or two small bass. However, a bass broke me off in the pads, and I lost my last bass hook and worm (on me). I decided to call it a trip when my grandpa called me, telling me he was heading back. My grandpa was fishing with the same lure, (YUM Dinger) and I asked him if I could borrow his rod. The sun was about to set, and I was fishing in low light in 2 feet of water. 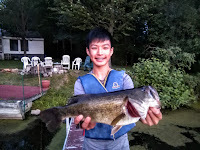 There was an opening in the mats in the marsh near our cottage, and I had pulled some small bass from there previously. If was sheltered and off a point, only 5 feet from shore. I even went over that spot before on the same outing. I was heading back, and I thought I'd give it another try. I cast my lure out, and was watching my line steadily move while my lure sank. Suddenly, my line twitched ever so slightly, and began to move to the left. I tentatively tightened my line, and when he fish felt it, it took off. The rod doubled over, and the fish began a series of runs. I don't know if it's something in the water, but the bass in Lamoka fight so much harder than on the golf course. It even towed the kayak around for a period of time! Eventually, I pulled near the kayak, and was about to grab it when it dove into the mat. I tightened up and couldn't differentiate between the heavy weight of the vegetation and the trashing of the fish. Soon, however, I was able to pull the fish out slowly. Right as the fish's head came out, I was taking no chances. I grabbed the bottom lip and hoisted the entire mass out, 20 lbs of weeds and all. Wasting no time, I paddled back the the cottage for photos. 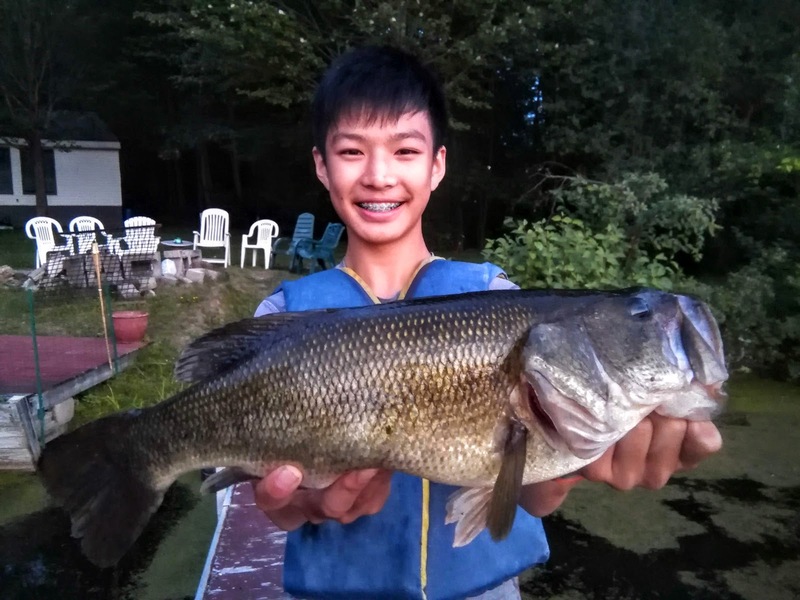 It was the largest bass anyone had caught all trip, and my grandparents immediately requested to keep it. However, we were leaving the next morning, and the fish was rather large, so I decided to release it. 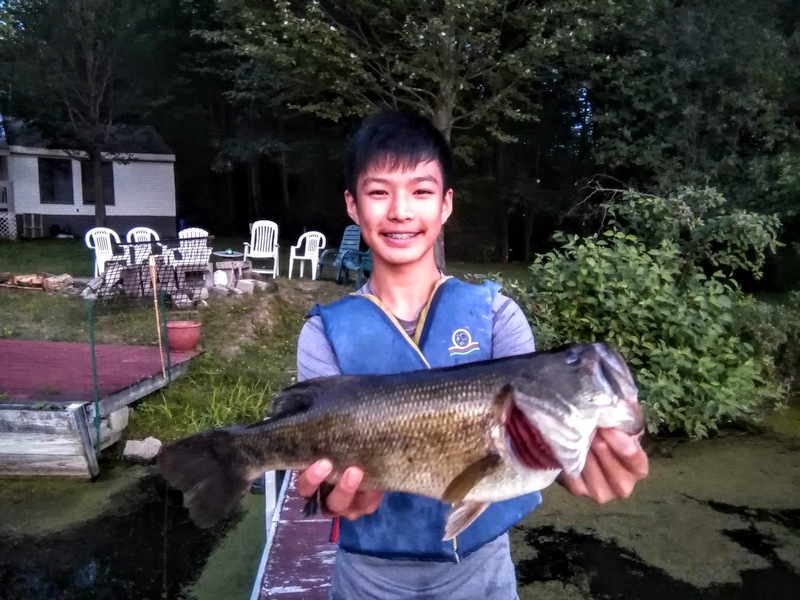 4 lb Upstate NY largemouth!!! 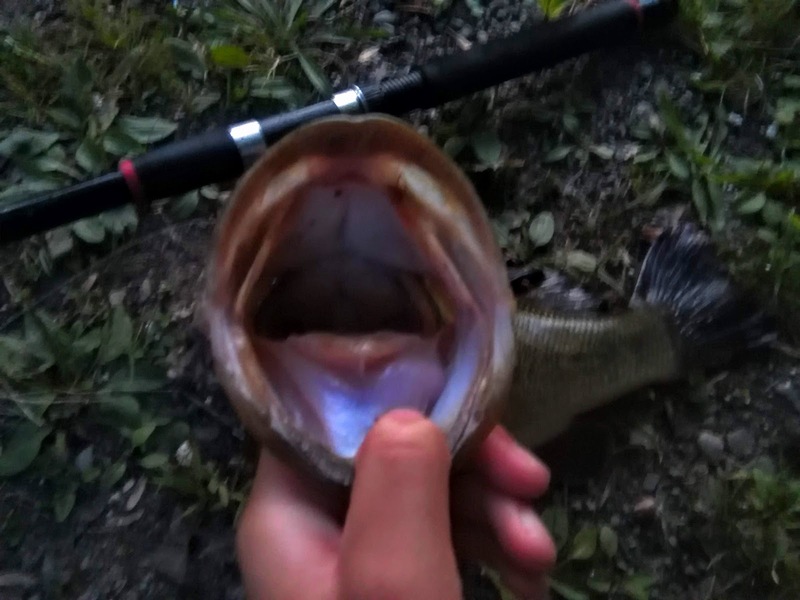 It was by no means that big or long, but it had one hell of a gut, and was my biggest lure caught bass to that date. It was a fitting way to end the Finger Lakes trip. I caught some very cool fish and 4 lifers... Hopefully I'll return soon and catch some more!